Pastisio is one of those Greek dishes that has always seemed intimidating to me, but also something I wanted to master. 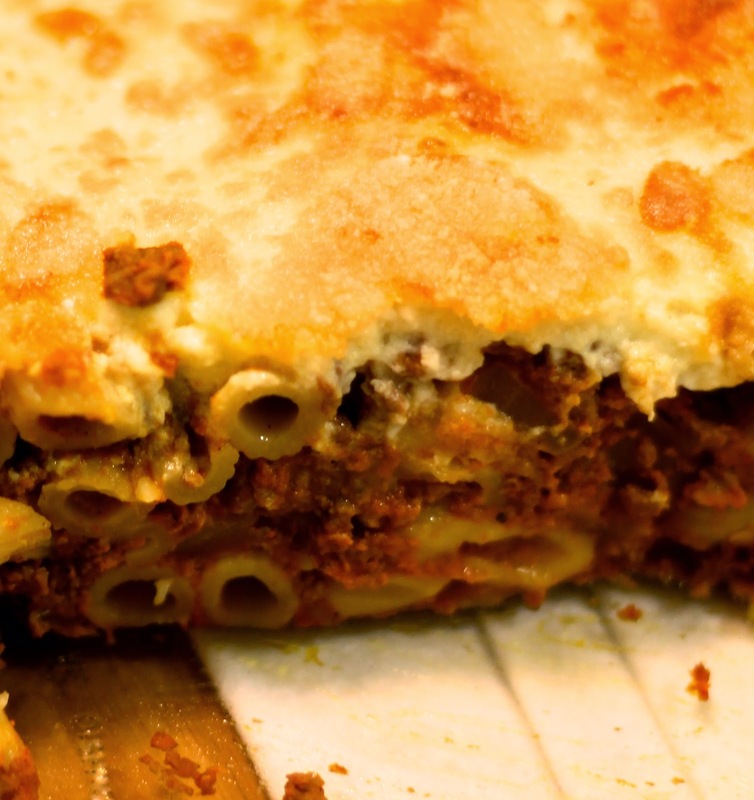 If you haven't had Pastisio, it's a delicious Greek casserole similar to lasagna. Rather than layers of lasagna noodles and ricotta, it consists of one big layer of pasta with meat sauce, topped with a creamy bechamel sauce. It's rich, decadent, and comforting. What more could you want from a hearty casserole? 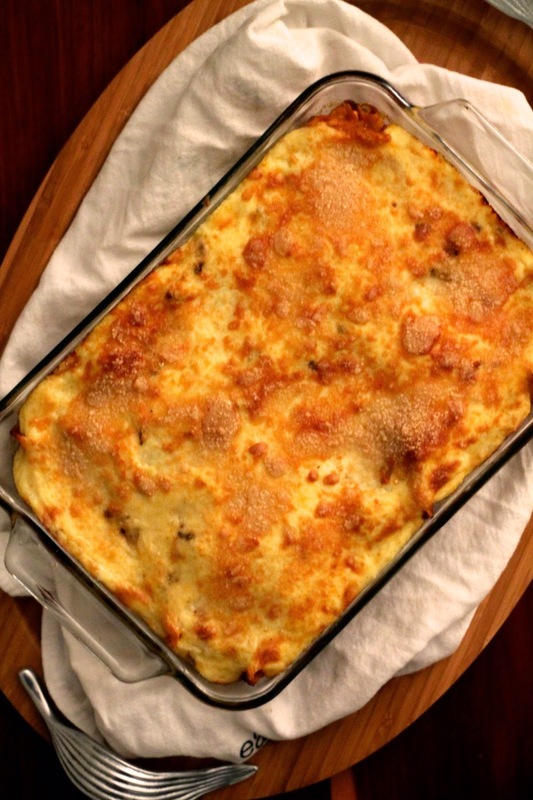 Also similar to lasagna, this is one of those recipes that everyone has their own version of. Some recipes call for half ground beef, half ground lamb, others call for a whole tablespoon of cinnamon. One recipe I saw had no tomato sauce in it, but rather only a small amount of tomato paste. I love tomato sauce so I added that in and was really happy with the results. This recipe makes a big batch (only half is represented in the picture!). If you're not serving a large crowd, I would still recommend making the full recipe and freezing half. I assembled two separate casseroles and let one cool completely before popping it in the freezer (I did not bake it prior). First, prepare the red sauce. Heat a large skillet over medium high and add the olive oil. Add the onion and sauté until tender (about 5 minutes). Add garlic and sauté for 30 seconds, or until fragrant. Add the beef to the pan, season with salt, pepper, cinnamon, and oregano, and use a wooden spoon or potato masher to break it up. Add the wine, tomato paste, and tomato sauce. Stir well to combine, reduce heat to low, and let the sauce simmer while you assemble the rest of the casserole. Preheat the oven to 350. Prepare the pasta according to package directions, drain, and mix with eggs and parmesan. Set aside until ready to assemble. To prepare the béchamel, heat a pot over medium and add butter. When the butter is melted, stir in the flour and whisk until the flour is completely incorporated. Whisk this mixture constantly for 1 minute or so while the flour taste cooks out. Stir in nutmeg, then gradually add the milk, whisking constantly, and bring the mixture to a boil. Continue to boil until the sauce is thickened, set aside. Temper* the eggs by adding a small amount of the hot milk mixture to the eggs, stirring constantly. When the eggs are slightly warm, add them to the milk mixture. To assemble the casserole, add the pasta to the red sauce. Stir well to combine and add to a large casserole dish. Top with béchamel sauce, spreading it evenly over the top. Sprinkle parmesan cheese on top and bake until bubbly (35-40 minutes). Let cool 10 minutes before cutting into squares. Enjoy! *Tempering is a process of slowly bringing eggs to a higher temperature before adding them to a hot liquid. By warming the eggs, you avoid scrambling them as soon as they hit the heat.